NOTE: The options on this tab allow you to automatically add markers to the data based on the action of a variable. Please use this carefully, as it can result in the system automatically adding many markers resulting in slow program performance. 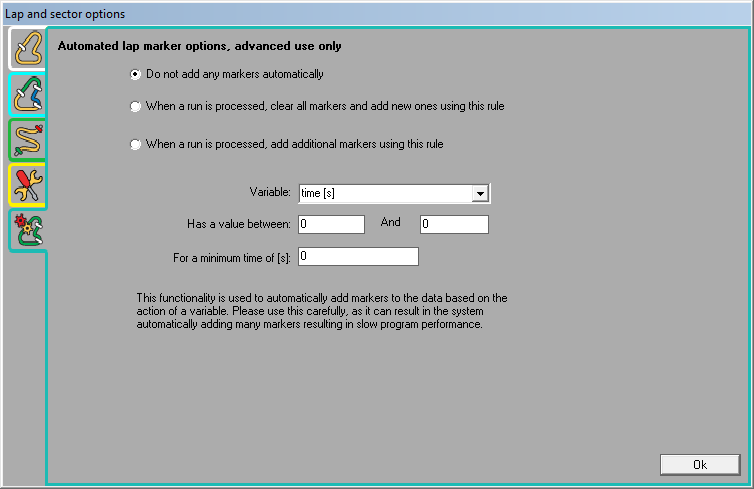 This will disable the adding of markers automatically based on a variable (This is the default option). When a run is (re)processed, all existing markers will be cleared and new ones will be added based on the rule - the variable, its values and minimum time. Additional markers will be added to the data without deleting the existing ones.